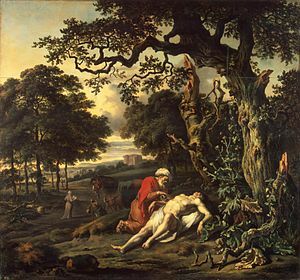 In Luke 10, we find the “Parable of the Good Samaritan”, where an expert in the law comes to Jesus and asks, “what must I do to inherit eternal life?” Jesus responds by asking him what is written in the law, to which the expert answered, “‘Love the Lord your God with all your heart and with all your soul and with all your strength and with all your mind’; and, ‘Love your neighbor as yourself.’” These two laws are also found in Matthew 22 and Mark 12 in the context of the Two Great Commandments. There’s a general rule in biblical literature. If it’s said once, it’s important. If it’s said twice, it’s really important. If it’s said three times, you better listen, because this is so very important. EG: Holy is the Lord – important. Holy of Holies – really important. Holy, Holy, Holy, Lord God Almighty – so very important. We’ve got these two great commandments repeated in three of the Gospels – there’s something rather important about what is said here. The expert goes on to ask a really good question: “Who is my neighbour?” which Jesus then launches into this parable. Author Ben ClaptonPosted on May 14, 2012 July 19, 2017 Categories Archive, faithTags Abolition, christianity, Compassion, Gospel of Luke, Jericho, jesus, Jew, Levite, Love, Mercy, Parable of the Good Samaritan, Refugees, Refugees and Asylum Seekers, religion, Samaritan, theologyLeave a comment on Who is my neighbour?